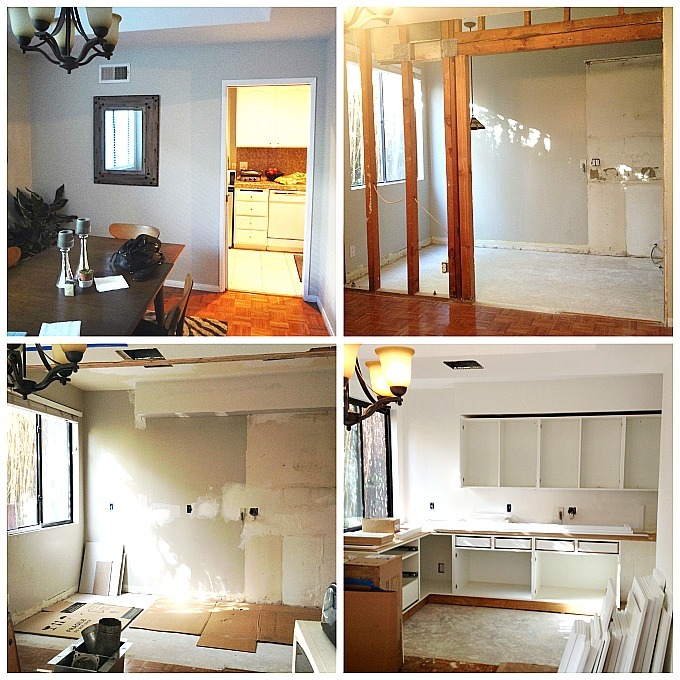 I’ve wanted to share my Kitchen Renovation Before & After Photos for the condo we have out in West Hollywood for quite some time now. However, every time I sit down to write and gather pictures it’s just so overwhelming, I give up and move on to something else! The problem is I have a bazillion photos of the place before renovation (super ugly), during renovation (super messy) and after renovation (super beautiful). Unfortunately, I don’t have my good camera with me when I’m out there to visit, just my iPhone, so the photos are not of very good photographic quality…or even taken from the same spot to show a good before and after comparison. Or even staged nicely (I had a home staging business for many years so the fact that these rooms/photos aren’t perfectly staged is killing me!) Anyways, bear with me, I hope you’ll be able to follow along and see the awesome change that took place! The kitchen was dark (even with that big window), narrow and UGLY! The breakfast nook was a waste of space in my opinion, especially since there’s a nice size dining room right next to it. 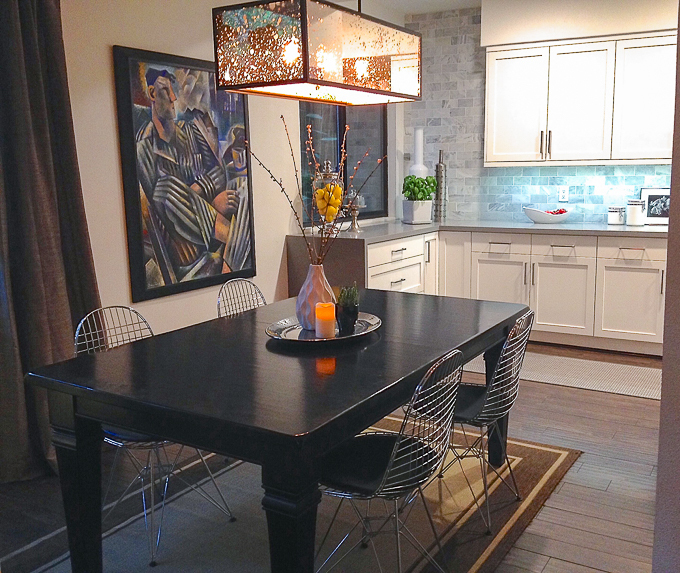 Who need’s a formal dining and breakfast nook right next to each other in a small condo? Not me, I’d rather have a larger, open kitchen. And that exactly what we tried to create within our budget. This condo was built in 1975 and I’m guessing at some point had a bit of cosmetic upgrades to the kitchen. Old cabinets had been painted an off white long ago. Old appliances. Ugly granite tiled countertops. And a tile floor that doesn’t look so bad in the picture, but trust me, it was! We removed the pocket door entry and opened it up a bit. Added a counter depth refrigerator, new farmhouse sink, faucet and dishwasher. 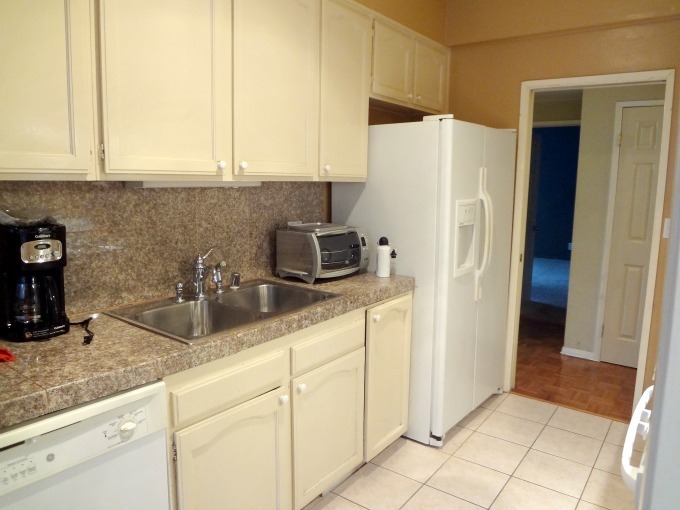 The cabinet to the right of the sink is a pull out cabinet with garbage bins. I would have preferred to remove the bulkhead and have larger upper cabinets but the contractor said we couldn’t do it (a whole ‘nother story that deserves a post of its own titled “Beware of Lying Contractors!”). The counters are quartz, which I absolutely love! In the bar we put Carrera marble counters but I wanted something maintenance free for the kitchen and the quartz fit the bill perfectly. But I got my marble in the backsplash which are marble tiles from Home Depot. There is also under cabinet LED lighting as well as new recessed lighting overhead. On the other side of the galley kitchen is the stove area. That tall pantry looks like it would be nice to have, right? Not really. When you opened it up you found there wasn’t much space because it’s on an angled wall so half of it was missing! There’s also not a lot of counter space next to the stove so in the renovation I decided to not put a pantry there and gain a bit more counter space. You can see we gained a little more counter space by not putting in a pantry. Originally I had planned on putting a microwave in over the stove. My son (who has excellent taste and is very opinionated) kept insisting we should put in a range hood instead. He thought, and I agree, that an over the stove microwave seemed much more “apartmentish”. I have to agree that the look of a range hood is so much more attractive and modern. I love it! After much consideration and weighing all options, I decided to forgo putting in a built in microwave altogether. I just couldn’t find a place to put it that looked good. I really wanted to keep the symmetry of the cabinets and a microwave just messed it all up. I might regret the decision to not have a built in microwave when it comes time to sell, but for now it works for our situation. The only thing any of us use a microwave for is heating up leftovers anyways! The most important thing that had to be done (besides gut the entire kitchen) was remove the wall between the dining room and kitchen. 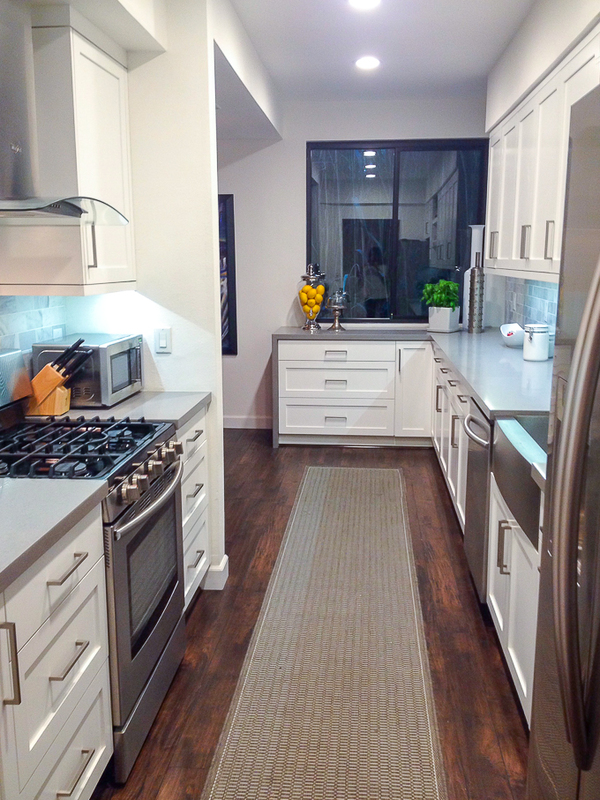 When I first saw the listing pictures and floor plan for this unit (we bought it sight unseen) I thought between the kitchen, wet bar and dining room there was plenty of space to create a large open kitchen. What I quickly found out is how expensive it is to that kind of work! Unfortunately, I had a budget to try to stick to and that was definitely NOT in my budget (bummer!). 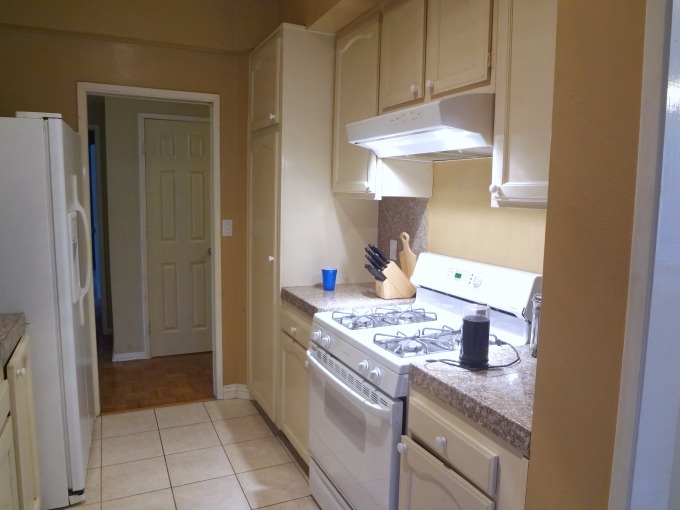 So we decided the most affordable route to go that would make the most impact would be to leave the appliances in the same location, remove the wall and add additional cabinets for more storage and counter space. And now look how much better this kitchen looks with added cabinetry and no wall! 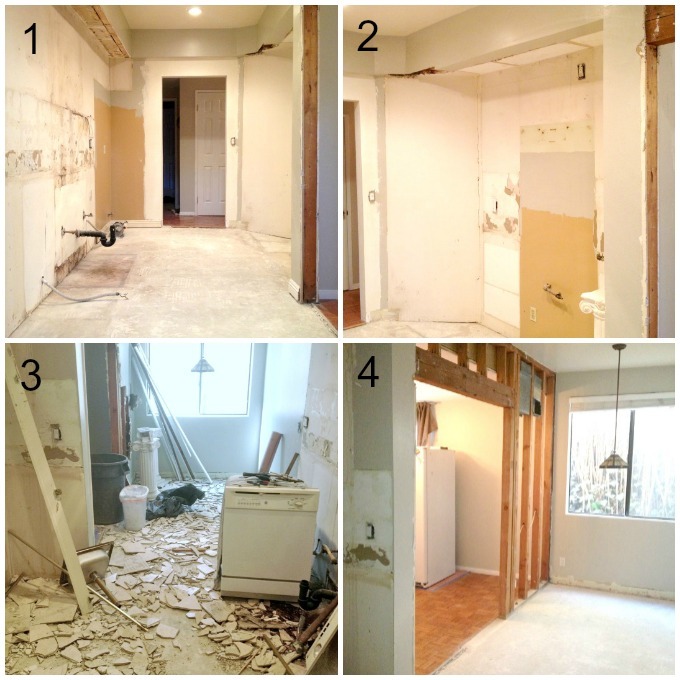 Removing the wall and taking out the breakfast nook and adding more cabinets just seemed to make much more sense and better use of square footage. 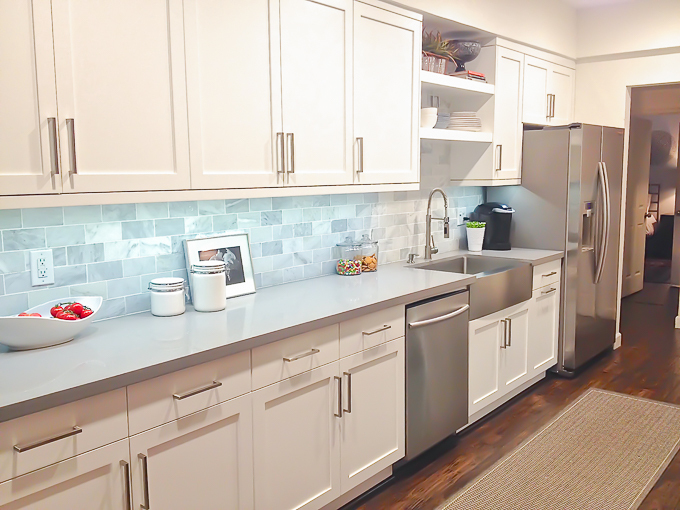 I love the “waterfall” counter top on the back cabinet. I think it really finishes off that cabinet nicely and feels more upscale. Oh, and of course, new floors helped too! Boy was it nice to see the old kitchen gone! And even better, I was so excited to see how much removing that wall made the space feel more open and brought in more light. That wall removed makes me so HAPPY! We couldn’t take the upper cabinets all the way to the window wall because there was only 6 inches between the window and the wall. So we just extended the bulkhead (you can see where the old cabinets ended by the paint on the wall) and added more upper cabinets as close to the window that made sense. Again, I wish that bulkhead was removed!!! I also caused myself some headaches by not deciding what to do with all the floors in the kitchen, and rest of the condo, in a timely manner. 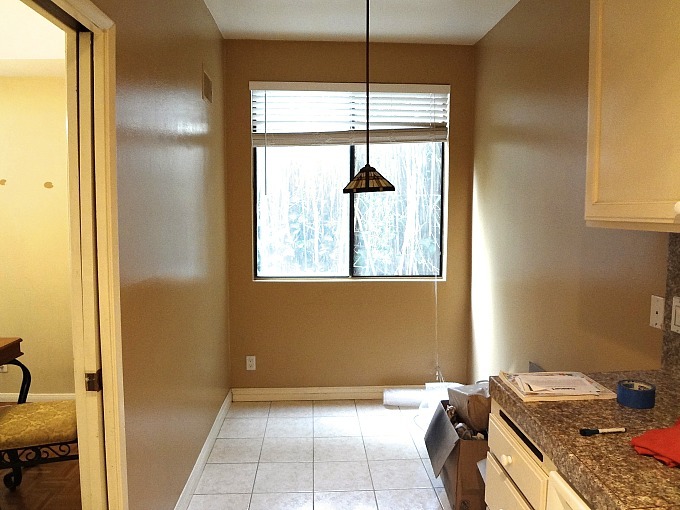 I couldn’t decide if I wanted to carry wood throughout the entire condo or put tile in the kitchen/dining area. By the time I decided and ordered the materials, the cabinets were ready to install but the flooring was delayed. I told the contractor to put the cabinets in first and not to worry about the floors. Frankly, having the floors installed by someone other than the contractor saved me a few thousand dollars! However, if I was to do it again, I would prefer to have the cabinets sitting on top of the floors and could have probably not had to have quarter round molding installed. Minor details but I think that’s the better way to do it. Once cabinets and countertops were installed, it was time for me to get to work and install the marble backsplash. That had to be done before the stove/hood could be installed. Yes, you heard me right, I installed the backsplash all by myself! It was a little time consuming, but was really quite easy to do and saved me a bunch of money doing it myself. Because it was so easy, I thought I’d be able to do my foyer entry as well. You can read about how well that turned out here! Finally, after many long weeks, the kitchen was finished. I love the final result. Such a huge change! That’s the quick tour. We also did some other construction of removing arches and opening up the doorways. I’ll talk about that a little later. Looks great. Hope you are on your way to my house next. Thanks Ed! Anytime you want help just let me know…you know I how much I love to decorate! Gorgeous!!! I want to remodel our kitchen but the hubby would rather move than live through the hassle of a renovation. Now that we’re empty nesters I keep telling him that I’m all in for a brand new house. And I mean, NEW! Congratulations on your kitchen, it really is beautiful. Thank you Linda! As an empty nester myself, I get the whole move to something new and different! When my husband retired from the military after 34 years of service last fall we sold EVERYTHING and started fresh. I love it. 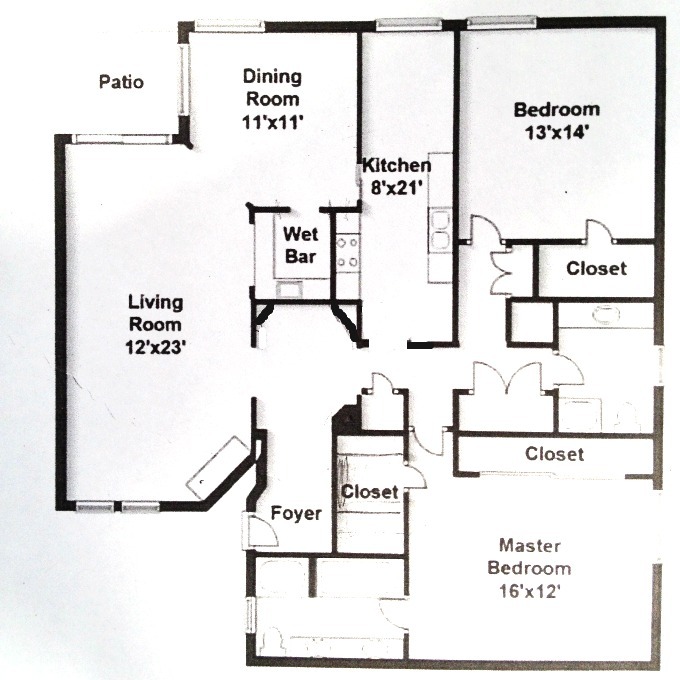 This condo is just an investment property that my son gets to live in which is nicer than where I am now…not fair! Thanks for stopping by! Thanks! It was kind of a headache!!! But worth it in the end. 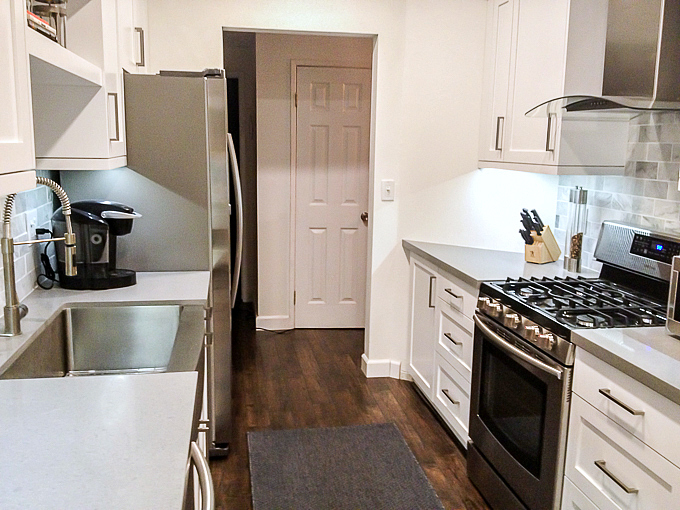 Oh wow, removing the nook and adding more cabinets–makes the kitchen so much larger. I’m in love with that backsplash, especially how you extended it to the ceiling. Look every custom. Just lovely. And you did it yourself…this is encouraging to me! My husband and I are closing on our first house ever. 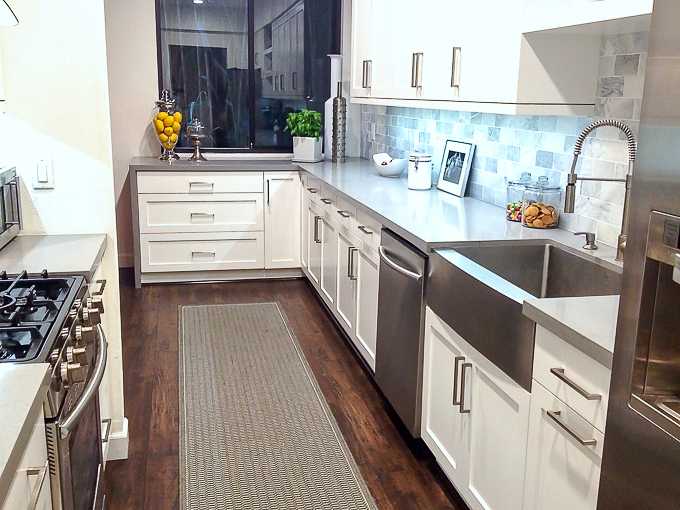 We’d love to modernize the kitchen a bit, so I’m glad to hear backsplash is a doable DIY. Thank you Sarah. I was so happy with how the kitchen turned out. 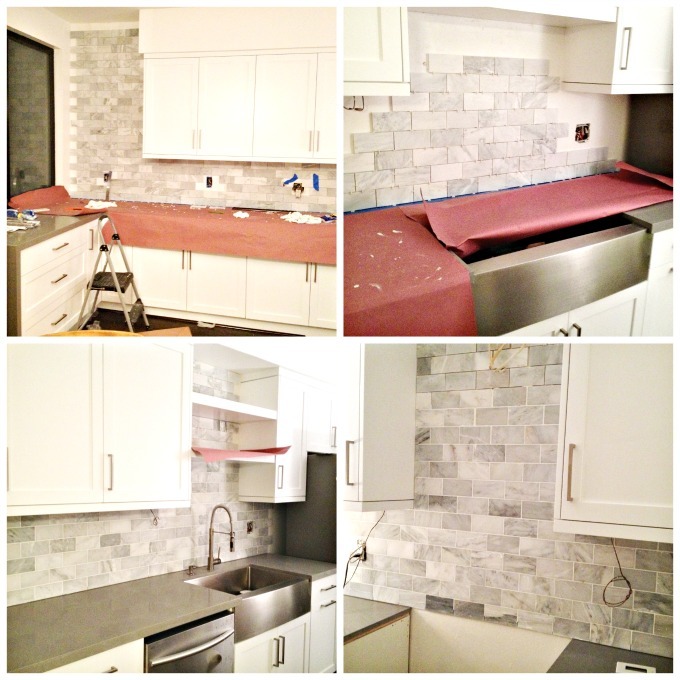 Doing a tile backsplash is soooooo easy! Don’t be afraid to try it! The hardest part is cutting the weird shapes around the outlets but even that’s not too bad. The marble tile is so lovely and I was trying to replicate that in our kitchen. I went to Home Depot but there was not nearly the variation in color that is shown in your photos. Would you share which tile, specifically, you used in the project? Thanks so much! Love your taste! We recently sold the condo so I don’t have any of the renovation information readily available anymore. However, I looked at Home Depot online and I believe this is the link to the tile that I used Marble Backsplash Tile Looks like it’s only sold online now and I think when I purchased it, it was only around $10 so the price has gone up. If you buy this, or any tile, buy extra, there’s always pieces in the box that don’t look as good as others. I was able to return the unused tile to the store where I bought them. Not sure the policy on online orders though. Hope that’s helpful! Thanks! Buying extra is a helpful idea. Love it. What flooring brand and color did you use? Love the way it looks with the white cabinets. I can see using this throughout whole condo. It’s laminate from Eternity Frontier Collection – Smoked Almond. However, I probably would not recommend it now. It’s very inexpensive and looks wonderful which was great but because it snaps together in planks, but it expands if water gets in the seams. Would not recommend it for any kitchen or bathroom. Or, if you have pets that might pee on the floor! Beautiful Kitchen! Do you recall where you purchased the cabinet hardware and what the name was? Thanks! Wow! You did wonders with the kitchen! I appreciate the added storage which is always needed – so smart! 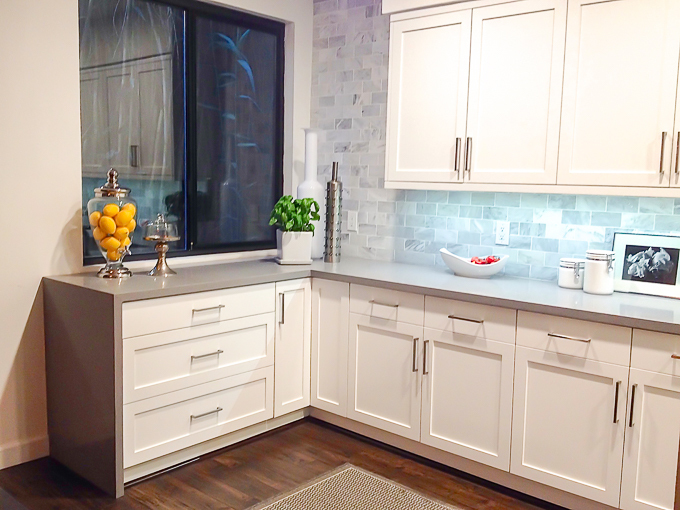 The cabinets, tile and flooring look fantastic . So many great choices and ideas. The updated dining table and chairs finish everything off wonderfully.